This years Fun Day, held on Friday 31st August at Barnard Park, saw the sun shining bright and a number of new attractions. This year, we were joined by a wood carver, who made some wonderful things, and who proved very popular with the children; as did the bouncy castle and slide, the face painting and the henna tattooing. The inflatable gladiators arena provided a challenge for some. The fruit kebab and smoothie stall was very popular again this year. If all that wasn't enough, Mr Brown's Pig entertained the crowd and the New Orleans jazz band played through the afternoon. 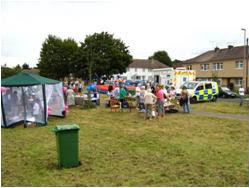 Local groups, including the Scouts, St Peter's Hospice, Emmanuel Chapel, St Mary's Church, Henbury Healthy Walking Group nad Henbury Library all had stalls, raising awareness of their activities and facilities. Representatives of Recycling and Housing from the council and the Police were also present with information and leaflets. Free balloons were given to the children. Henbury Community Council raised over £200 on the raffle, so thank you to the traders for their donations. Thankfully there was no need to call on the services of the first aider, or the lost children's contact person. It seems the afternoon proved very enjoyable for one and all. Many thanks to everyone who helped make the day possible and look out for next year's Fun Day details in the Summer 2008 edition.